Click on image above for more on the book at Amazon. In a comment to a blog post, “Stupidity at the Core of Human Misery,” Eric asked about books that explore the current state of the Indian economy. Here’s what I feel about the popular literature on India’s economy. Loknath kindly mentioned a few popular books on the Indian economy by various authors (here, and here.) Khushwant Singh is a journalist and authored several fiction and non-fiction books on India. He is a popular writer much celebrated by some but I unfortunately find him shallow and hasty. I would not read him to get a reasoned perspective on important matters, least of all the state of the Indian economy. Politics perhaps but certainly not economics. Ed Luce’s “In Spite of the Gods” was the usual claptrap about India at the verge of becoming an economic heavy weight — in spite of the Gods! The title of Luce’s book immediately appeals to the prejudice that somehow Hindus (the majority of Indians are Hindus, although it may not appear so) with their mindless worshipping of millions of idols are somehow congenitally incapable of economic prosperity, and implies that that incapacity has something to do with the fact that they worship idols. “Honest elections” means . . . Don’t know but I guess it has something to do with the fact that the elected have a much higher percentage of criminals (murderers, rapists, scam artists, blackmailers) among them than the general population. I have to admit that I take a dim view of any author who regurgitates mindless economic half-truths. I pass it off as mere ignorance. But when someone talks of the “alarming rise of Hindu nationalism,” I am not as charitable. I think it is naked bigotry and prejudice against Hindus. According to them, Hindus are supposed to be passive residents of a land and should not become uppity and talk about national pride or pride in their culture or ethos. Everyone has a claim–a first claim even–to resources but Hindus should take a back seat. Moving on, Gurcharan Das’s “India Unbound” is a very popular book. The reason is understandable. The Indian urban educated chattering classes definitely see the squalid condition around and wonder when it is all going to change. The fantasy is that any day now India will become an economic superpower, an IT superpower or some undefined thing. Books like IU show how India has made some progress economically after stagnating for decades (if not centuries) and then push the fantasy that India will arrive any day now. Required reading for all who are burdened with a vague sense of inferiority and want something to cling to. Nandan Nilekani’s “Imagining India” is a worthy addition to the class of books that are written by the extremely successful in the business world (such as Mr Das above), and which deal with the Indian economy. Being successful people, they have to be cautious and politically correct. These authors therefore generally avoid the uncomfortable matter of why is India poor. Political correctness is a barrier to writing a book about why India is poor. India’s poverty is an unavoidable consequence of the economic policies that Indian governments have imposed on the country. Economic policies are made by governments. Governments are controlled by people. Most of the people who have controlled India at the central level come from one particular family. Jawaharlal Nehru, Indira Gandhi, Rajiv, Antonia Maino aka “Sonia Gandhi”, and Raul Vinci aka “Rahul Gandhi” in the pipeline. If you ever inquire honestly into why India is poor, you will have to conclude that that family has been as good for India as a metastasized brain tumor is to a body. If you conclude that, you are ill-advised to write a book saying so. And if you do write one, you are unlikely to be published. And if you are published, you are unlikely to be read. So there. I am not a voracious reader and therefore I may be totally mistaken about this. But from what I can tell, there are book about India and how it has liberalized and become unbound. There are books which deal with what great things are in store for India. There are books what things have to be imagined and implemented for India to rise. But these books appear to never address the question “Why is India poor” and list the reasons for its persistent and deep poverty. To my (perhaps simple) mind, it appears to be impossible to fix a problem unless one fully understands the cause(s). What we definitely need is a book that treats that question for most of the book, and if it does that part competently, the answer to what should be done would be too obvious to be stated. I recall reading that someone said somewhere (how’s that for specificity) that for an economy to prosper all it had to do was take any Indian economic policy and invert it. India is a case study in how to impoverish an economy. Take the inverse of its policies and you have a winning formula. Loknath mentions Ram Guha. A very able writer on cricket who has written voluminously on Indian history, I am told. I don’t know anything about cricket, and I definitely don’t take kindly to Marxist interpretations of Indian history. Does he know anything about the Indian economy? I suppose as much as a dentist knows about rocketry and space travel. Which brings me to APJ “Dr” Kalam. He used to head the Defense Research department before becoming the president of India. His record as an administrator is patchy. He is a technology cheerleader. A genial grandfatherly man, I suspect he knows about as much about economics as I do about parasitology, which I take to mean how to sit in a parachute. His books should be required reading for high-school students but anyone above the age of 20 reading them seriously should be sent back to high-school. VS Naipaul is an absolutely keen observer of India. I have read some bits of his non-fiction and I have promised myself that I will read his books on India soon. I would read him for understanding the sociological background of India but naturally not for an economic perspective. Loknath mention Arvind Panagariya. I agree that Panagariya is worth reading. Another respected academic who writes in the popular press is Kaushik Basu. Put him on your must read list for understanding India. I think if you are living in India, you don’t need books to know the current state. You can read the news papers about once a month and keep your eyes open, and you will know exactly what the state is. To understand why it is in the state it is, think about the mass illiteracy, about limitless democracy, mass poverty, and India’s colonial past. Finally, thanks to Loknath for his recommendations on books to read on the matter. I hope my comments on some of them are not interpreted to be disrespectful of his opinion. I am a bit confused about your recommendation of Bardhan’s book and your criticism of socialist policies of Congress esp. Nehru era. Bardhan compares Nehru’s policies with those of China and concludes that China’s socialistic policy provided the springboard for that country’s giant leap today. Though, he seems disenchanted by India’s socialistic policies beyond Nehru era, he does not fault Nehru for taking a socialistic path in the initial years. Rather his unfavourable comparison of India with China gives an impression that he would have preferred India to be more socialistic – at least immediately after independence. A brilliant mind but I am allergic to socialism and leftist rhetoric. I have read most of the popular books on the Indian economy. My favorites are India Unbound and Imagining India. IU turned me into a free market fundamentalist and hater of socialism at an impressionable age. So I do not understand why Atanu does not think too highly of it. II is also quite good. But 2 books that really excite me, because they perfectly describe the India situation although not even mentioning India are Free To Choose by Milton Friedman and Road to Serfdom by FR Hayek. If you want to know why socialism is evil and free market system is the only just system read these 2 books. I read both of Ayn Rand’s popular books as well. Nobody writes fiction like Rand.Brilliant. Every teen should read her books. Rand was very good at identifying the evil that lurks behind humanity. Socialism. Collectivism. Oh sorry – please delete the duplicate comments. ”Everybody loves a good drought” by P. Sainath. I would recommend it as an answer to why we are poor. Although a little dated, I am believe most of it applies to significant parts of our country today. The impression it left me with, is of our country, as one with an unscientific / uncritical approach to governance and life. Probably should have done that here- oops. I found the book, “making India work” by the Fab India founder, William Nanda Bissel, very thought provoking and interesting. If one is interested to understand the economics, polcies etc from the rural artisans and farmers point of view, a really good book. One simple example i can cite for uneven growth is the amount of money that the house maids earn. The average in New Tippasandra area in Bangalore is 1000 Rs per month. To put it in perspective, its 22$ a month. My house maid in Chicago used to charge 20$ an hour. A s/w engineer in Bangalore with 5 yrs experience earns roughly one third of an engineer in the US (9L per annum, that is, 20,000$ a year, which is one-third of what we would see in the US(60K)). Its that uneven. Sabarish, you hit the nail on the head. US Vs India comparision is baffling given that we not only earn less but pay more for almost every good or service that an American in his country pays for…EVEN IF I were to convery rupees into dollars, almost about everything costs more in India now., This is where I am uncomfortable with usual explanations like demand-supply and Inflation and PPP adjusted cost of living. We are an absured economy of cartels. To me it appears like just over 5% of India makes customers and consumers for every business that exists in India and elsewhere who sell their wares to India.period. See Atanus post of per capita GDP time equivalent of cost (PGTEC) for a more stark contrast of this phenomenon. Here is a quote from Pranab Bardhan’s interview. So obvious but so overlooked and tolerated in public discourse! In your opinion, what are the major regulatory challenges that India faces today? The major challenges are those of excessive political intervention by the ministries, capture of regulatory bodies by the interests they are supposed to regulate and of sinecure jobs for retired and non-expert bureaucrats. Thanks for saying this. I read Das, Nilekani (and not to mention about 40 pages of that horrible Ed Luce’s crap) and then got very confused. It seemed that everyone liked those books…. except me. About Ramchandra Guha, I doubt his Marxist credentials, he is one of those pen baniyas who likes to be politically correct. He has degree in economics and social sciences and I have never read his writing about those topics. Then he goes around questions K Elst’s training as a Historian. The last link about development being uneven was a killer one. I loved it. Finally, did you read Hamish McDonald’s book on Ambanis ( http://www.amazon.com/Polyester-Prince-Rise-Dhirubhai-Ambani/dp/1864484683 ). Although he cronicled Ambani’s rise, he explains the contemporary socio-political situations in India (and some lesser-known history) to the uninformed reader. Reading the book, I think he was one of the very few western writers who has got most of India and it’s institutions right. The book, as you can imagine, is banned in India. I have got mot much respect for Sen and knowing his background I am not surprised that he was written those stuff. I also do not believe that Bengalis made India (it is actually the handiwork of three Gujratis and a Kashmiri). But as a non-resident Bengali, I am interested to know what is your problem with a Bengali mind. Yes, we have Jyoti Basu and Amartya Sen, but please do not forget that we also had Swamy Vivekananda and Shyamaprasad Mukeherjee. It’s just the Bengali leftists–that annoy me–for some reason Amartya Sen types seem to abound in Bengal. And abroad types like Gayatri Spivak at Columbia university (also Bengali). Why so many leftists there ? Do you know the reason? As for the great Bengalis, of course, I respect them, as I would respect great Indians whatever region they might be from. Is Guha a Bengali name? Anand, Most academics and high achievers incl. in business start talking of plight of “poor lil boy on the street” as their own, once they have “been there and done that”. This is pretty much normal and happened without exception.incl. the stingy warren buffet who thinks america should be more egalitarian. I think such stunts should not be branded as socialism as practiced as means to guarantee poverty.. the way chacha nehru did. Bill Gates had no business doling out money on bogus economies like ours. This was something our socialist government should have accomplished long back. I am compelled to borrow examples of scandinavia and most of western europe here. Wouldnt you call their welfare economies socialist. They are more protectionist than us and always were but unlike us they are not a failed state. Their historial circumstances (starting from french revolution of clergy-nobility-everyone else) has all the ingredients of people subscribing to the idea of socialism and their societies dont suffer from disparity and disease like we in India do. I think you to make a distintion between doctrines that crooked leaders subscribe to vs the doctrines on which economic policies are made and implemented. There is no one right way to be despining one thing over another categorically. About Kerala and Bengal, yeah right, I suppose Arundhati Roy is the brilliant intellectual Kerala has produced… As for Bengal, that was a long time ago…People like Vivekananda and Tagore…Name one famous Bengali intellectual in comtemporary India! Nirad Chaudhuri (as caricatured by Naipaul) types and Amartya Sen types seem to flourish there…the leftists from there have done way too much damage…. > that we also had Swamy Vivekananda and Shyamaprasad Mukeherjee..
that we also had Swamy Vivekananda and Shyamaprasad Mukeherjee.. It is actually pretty easy to read Amartya Sen without labeling him in any way. People like Amartya sen and the ones you quote know very well what they are speaking. Well that is what leftists generally do, they cover their ideas in a humanitarian cloak, because when you take away the humanitarian pretentions you realize the ideas they are advocating are quite pernicious…Fine Amartya Sen might have something to say of value such as when he says that the problem with food in places like India is not having enough food but distribution and so on…I think many people are aware of what he says…it is when he thinks that because he obtained a prize in economics, he is an authority on everything on India, such as its history and politics and culture is when you have got a problem…. 1. Historical: The communist influence in Bengal started with an organization with extreme traditional roots. Anushilan Samiti that was created to keep the ancient Indian martial arts alive (like wrestling) and re-construct the spine of the Hindu society produced many strong and able-bodied patriots who challenged British through the path of violence. Initial British response was to lock them in jail and then discredit them as ‘Swadeshi Dakait’ (robbers using patriotism as cover). After MN Roy and his group created communist party in Tashkent in 1920, they began to contract both Anushilan Samiti and splinter group Jugantar for membership. British resisted CPI initially. Post 1930, the strategy changed. British not only began to use communism/socialism against Gandhian influence, they began to supply communist books and doctrines to the jailed members of Anushilan Samiti and Jugantar. This is the beginning of the influence. These jailed members had no sympathy for Gandhism and some of them found inspiration in Bolshevic revolution and Lenin’s doctrine. Some historians claimed that British did it to ensure that the stray violence against it’s administration can be stopped because Communists believed in war with state when the time comes, not the stray violence. The base for communists was formed. Post 1946 riots in Kolkata and Noakhali, Gandhi’s popularity in eastern India was in all time low although communist support for Muslim league did not translate into any kind of popularity among Hindus. But the ideological seed was already installed and poison tree began to grow, specfially in the academia. After SP Mukherjee’s death, there was none to lead Hindu Nationalism and Nehruvians helped communists to rise to prominence. In 1971, Bangladesh war began and millions of refugees came to West Bengal. Communists made a bet that these refugees will not be going back and can form their most important vote bank. Eventually they were right. Once in the power, nothing could stop them from installing their own in the top tiers of every government controlled organization (and in India, everything is government controlled). These people eventually installed policies that would help their sympathizers and ensured that no debate can occur about communist sympathy. I remember how translated soviet magazines were supplied to well-to-do middle classes free-of-cost (tax-payers were paying for it) in the name of “the cause” (nothing irritates me more than those words today). The extreme unionism ensured that capital runs away from the state, after all “labor class” became “politically aware”. 2. Cultural: When one says culture in Bengal, it more or less means the mixture of self-centered middle-class “we-are-the-best” jingoism and few bright genuine cultural output that few giants produced during pre-independence days. Look under the hood and you will find a community at unease about it’s roots, uncomfortable at it’s long history of prosecution by foreign powers and irritated at the prospect of any change that would force them to do the jobs that requires skills different from the skills required by a clerk in British administrtion. British wanted to create a workforce educated enough to carry out the low-level jobs and intelligent enough to know their position without being told explicitly. This created a very selfish, complacent and all-knowing working class that is capable of creating hurricanes in the tea cup but would not move their rear end from chair to help the fellow human. At times, there came giants who spotted the trouble, criticised this complacency (like Tagore did), yet nothing could move these “Bhadralok”s. Because of this complacency and lack of ambition, when they saw that communists were destroying Bengal, all they could do was to vent in their own homes, but did not posses the inspiration to stop the destruction. Subsequent generation chose to proceed with the flow. There is no intellectual today in Bengal, everyone is a group thinkers willing to ride the current wave to make a few bucks. There is also another side to it. Gokhale, much to his discredit, expressed “What Bengal thinks today, India thinks tomorrow”. That is pure hyperbole. But the contemporary Bengal, having pitied Northies and Southies for not being chosen as the one for clerkship in British administration, told that lie to them for years. Our fall began when after loosing most powerful free thinkers, our previous generation began to believe their own lie. Sen comes from this historical and cultural landscape. Despite serious differences that he had with communist government in WB, his student life was spent at a time when communist influence was being consolidated in academia. Apparently, it went in his intellectual inheritance. Guha is indeed a Bengali surname. But I seriously pray to God that he is not a Bengali. Our community has more than their fair share of self-loathing self-hating destructive intellectuals, we certainly would not miss this Guha. “Everybody loves a good drought” by P Sainath is a must read book about development. My search for the question “Why India is poor” has started with this book. Can you tell me what is wrong with my previous two comments? They simply disappeared after I hit “Submit Comment”. If the leftist educational materials that were promoted amongst Bengalis could do so much damage as far as their national identity is concerned, imagine the damage done to young minds by the Indian educational system which practically teaches Indians nothing about their real history, most have to learn it by themselves. That was wonderfully put. Never suspected the “British Connection”. Now that’s one more thing we can safely blame on Nehru and the Brits! Guha is NOT a Bengali. His ancestors are from Tamil Nadu. which practically teaches Indians nothing about their real history, most have to learn it by themselves. You just made me remember those days when I used to read through pages of RC Majumdar’s book after spending 10 hours in the office everyday. Those were the days. When MM Joshi thought about bringing in the much needed change in the history textbook, I remember the hooplas and protests by the secular bullies. Eventually the change ended in a spectacular show of hubris and incompetence. The man(Ram Guha)himself explained in an interview that his name should actually be ‘Guhan’, a common name in the Tamil Brahmin community to which he belongs. For some reason, it was shortened to Guha leading to the common confusion. Sid can breathe a sigh of relief. Anyway, my husband remembers when he was in high school, he had read a book on Indian history written by an Englishman, which explained Indian history (before British colonization) without whitewashing any of the gory details–this book stuck in his mind, he says, as the schools never taught such things, and made him curious to continue to read on his own about Indian history as an adult. We have never found that book as it was lost when my husband’s family had to move from Kashmir (their house was burned down and they lost everything, including precious things like old books and family photographs) and he does not remember the author, but it was an excellent book he recalls, although written before the fifties. It is amazing what an eye opener a single good book can be with respect to these things. I believe the truth should be told in the history books so Hindus can properly understand their history. Intelligent, informed people who read selectively understand the truth about Indian history, but at the popular level, much confusion is caused by the leftist rewriting of facts…it is at the popular level that a proper understanding of India’s past is necessary…. Anand manikutty you should put a lid on it. At least take time to put some thougths before commenting. Sheesh. The same people who created the problems know the solutions best but would never correct it for they cant afford to get de-elected and live under the rules that they made. It is in the interest of the Govt. to keep people cluless. As regards listmania on India-centric books, Atanu’s pick is the best. Just live in India for 6 months and read the newspapers once a month. That should more or tell the complete story. I am following the debate very closely here. There is one problem lies in the core of the discussion. Who are the students reading these books? Student at Premier Indian colleges are too busy in entertainment stuff and these serious talks will make them sleepy. No one here have been discussing why there is so much insulation between academics and real life discussion about any burning topics. There is one question pondering over my mind from last two year : “Why India is still poor ?” . Atanu sir’s blog has helped in learning these facts in lay man language. 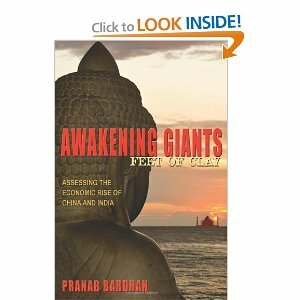 I will request gentlemen/women here to give us a list of few books so that an individual from engineering background can understand in depth about the field of economic and social development of India. @As for Sen getting a lot of respect at Harvard, Doniger gets a lot of respect as well. I am not impressed by his ideas…The Argumentative Indian does not flow in terms of language and most of the ideas in it make no sense to me, it is tedious reading, and strikes me as contrived, such as when a man speaks of things he does not really belive in. Again, I believe a man should stick to what he knows best, in his case, economics, and cut the nonsensical discourse….Sen as far as economics is concerned is not in the league of, say, John Nash…As for his ideas on development, people understand these things without reading much of what he has written…. Anand, I dont get why you sound disappointed. Everyone is speaking their mind out and our minds are as worthy to think as our circumtances made it to think. you need not sound fixated on your point of view to the point of desperation. Honest readers and commenters read every bit of everyone’s commments before writing something. Everyone here is from the same liberal school of thought as you are. Amartya sen is not a man with some secret comi agenda to impoverish india with his socialist rants. He is a man of different times motivated by a different set of concerns that we need not OVER-ANALYZE. Lets just appreciate the man he is. Atleast he is not a bigot like nehru. I guess the book would be either Vincent Smith’s “Early history of India” or Will Durant’s “Story of Civilization”. They, along with people like JN Sarcar and RC Majumdar are the people who placed objectivity and rigor over political ideology. I was always surprised how seemingly uneducated get their priorities right even when, at times, they can not explain the choices they make. I am not going to denigrate the role of education in an individual’s life. Problem arrives when your own education forces a world view that is completely disconnected from reality. This is exactly what is wrong with most elite universities in India. Education, specially the variety that exists in humanities section of universities like JNU, enforces a particular world view on it’s students instead of helping the students to gather information from real world, analyze them and understand how or why something happens. Since this is a thread about books, I hope Atanu would not mind putting the google books link to Smith’s book. I am simply glad that Guhan is not a bong. No we can not just blame Nehru or Brits. There are many Indians who understood the direction communists would be taking and they choose to do nothing. Their silence and procrastination is inexcusable. Anand manikutty, you should put a lid on it. At least take time to put some thougths before commenting. Sheesh. From the fact that this has made it past the moderator, I can only assume that this meets this blog’s standards. First of all, not all comments are held in moderation. If you have commented before, the comment is posted straight away. So that comment directed at you was not moderated by me. Second, I don’t delete comments as I believe in an open discussion. As I have mentioned before, the only comments that I do delete are those that are gratuitously abusive. The comment which you object to is expressing a point of view about you. This is not in any sense unique. See how others have responded to a commenter named Rawat — addressed him directly. I believe that if one takes a position in a public forum, one is exposed to responses good and bad. The thing is you decide whether you wish to respond or ignore a comment. Being overly sensitive in a public forum is generally not a good thing. I think that it is better to just not engage in public debate if one has a very sensitive nature, because what others feel and say about one is beyond one’s control. As for Amartya Sen being a humanist, sorry, I do not need the humanism of someone who does not understand his own history and culture, and lectures to Indians from the West. Most of his economic theories seem common sense to me. Again Vivekananda knew enough to understand that a nation has to be clear about its identity before it can accomplish anything worthwhile as a nation, something our deracinated leftists do not seem to understand. If you read the Deussen part properly by him, you see that Vivekananda is saying that critical thinking seems to have died out in India, and that happens when people do not understand the roots of their own culture. As for Gandhi, Gandhi did not have gaps, he seems to have his own weird understanding of Hinduism, most of his eccentric ideas in fact were from his Christian readings. Today, all intellectual and political life in India is tilted towards the left, it is so entrenched that people do not quite realize how great the brainwashing has been. As for engaging in a discussion, I am merely pointing out some things I do not agree with on your posts, as this is a blog for anyone to comment on, and judging from your comments, I do not thing it worthwhile to engage with you in a discussion, but I do not want readers to be left thinking Vivekananda was a nobody because some British philosopher no one reads found little value in him. Two weeks ago I commented on this thread that you should put a lid on it. The more you write, the more you appear to be an idiot. I am sure that other readers of Atanu’s blog will agree that you have no sense of proportion. I know that Atanu can delete this comment but I take this chance that at least for a while this comment will be up and you will take my advice — just STFU. You have proved to all that you are an idiot. Now you can stop. just with part of just STFU did you not understand? It is not true. Russel wrote this about Tagore in a letter to Lady Ottoline, dated June 19, 1913 – not Vivekananda. Please READ properly before you comment! I did not say the quote was by Russell, I was responding to Manikutty’s assertion that Russell said this and I was responding to him! I never said that Russell said this about Vivekananda. Which makes me wonder what motives people like Manikutty have in passing off fabricated quotes as real, to defame Hindus I suppose? You mention ‘To understand why it is in the state it is, think about the mass illiteracy, about limitless democracy, mass poverty, and India’s colonial past.” Yes, the reason is not only the colonial past but also the understanding levels and corruption levels of the governing personnel and their advisors including economic advisors. Just to take one example, export of food items or items used in production of food otems is the main reason for runaway food inflation in this country. This simple fact is being ignored. An honest and governing body in India will promulgate law for at least 20 years ban on exports of food items or of items used in production of food items. To understand and also for rapid removal of poverty , the seminal book ” 5 Years Guarantee : How to make India Richer ” (ISBN 978 81 7049 384 6 ) is with fresh approach in developmental economics and public policy. Simple ideas do great jobs nost of the times when nothing seems to be working.